The Beatles 50 Years Ago Today: March 17, 1967. Beatles Radio: The Beatles, Solos, Covers, Birthdays, News The Fab 4 and More! Recording began on the Sgt. Pepper song She's Leaving Home during this session. The song had been written after Pau McCartney read a report about a teenage runaway named Melanie Coe in the 27 February 1967 edition of the Daily Mail newspaper. John Lennon contributed the chorus lines, and the pair decided that a string arrangement would suit it. George Martin was unable to write a score after McCartney asked him to at short notice. 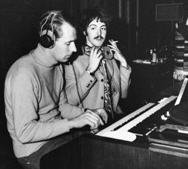 Instead, McCartney approached freelance producer and arranger Mike Leander, who provided the string parts for the song. Martin saw the move as a slight, but later acknowledged that McCartney's impatience had been the key factor. 'All right, then,' he said, and that ended the conversation. I recorded it, with a few alterations to make it work better, but I was hurt. I thought: Paul, you could have waited. For I really couldn't have done it that afternoon, unless I had just devoted everything to The Beatles and never dealt with any other artist. Paul obviously didn't think it was important that I should do everything. To me it was. I wasn't getting much out of it from a financial point of view, but at least I was getting satisfaction. The score itself was good enough, and still holds up today, but it was the only score that was ever done by anyone else during all my time with The Beatles. Martin agreed to conduct the musician during this session. They were Erich Gruenberg, Derek Jacobs, Trevor Williams and José Luis Garcia on violin; John Underwood and Stephen Shingles on viola; Dennis Vigay and Alan Dalziel on cello; Gordon Pearce on double bass; and Sheila Bromberg on harp. The recording was completed in six takes, with the first becoming the basis for further overdubs. This had the harp on track one, double bass on track two, violins on three, and violas and cellos on track four.